The single biggest trend for the next year or so will be the collapse of the $USD. The fact is that the Fed will be forced to walk back its hawkishness. Indeed, this process has already begun with Janet Yellen testifying before Congress that the Fed was just about done with rate hikes. 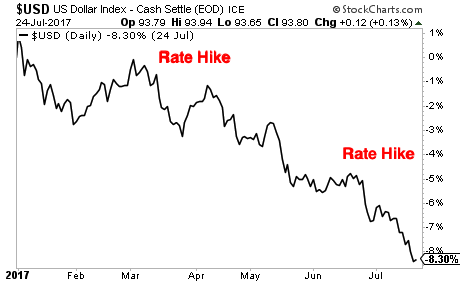 Bear in mind, the $USD had already dropped 8% year to date during a period in which the Fed had hiked rates TWICE. So what will happen to the $USD when the Fed walks back its hawkishness and slows down the pace of rate hikes… or even STOPS hiking altogether? 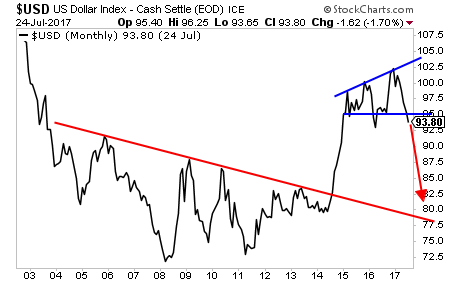 Again… the $USD is set to collapse. And as it does, inflation plays will be EXPLODING higher. If you’re not taking steps to actively prepare your portfolio for this, you need to so now. We are giving away just 1,000 copies for FREE to the public. Today there are just 87 left.